So you’ve summoned the courage to try yoga — congrats! — but you aren’t quite sure what to bring to, or expect from, your first class. Don’t fret. We got tips from two yoga instructors, Irene Pappas (@FitQueenIrene on Instagram) and Ahmed Jabali-Nash (@yogiman_83), to help you survive and thrive in your first session. A quick Google and/or Yelp search can help you identify a yoga style, studio and teacher that best fits your fitness regimen and goals. Teacher and instructor bios online can also be helpful. “For beginners, I’d recommend finding something that is touted as a beginner’s yoga class or a hatha-style class that moves at a slower pace,” Pappas advises. “If you’re an athlete, you might enjoy a vinyasa, Rocket or ashtanga class,” Jabali-Nash adds. If online sleuthing doesn’t do the job, consider asking friends who practice yoga for their studio recommendations. Better yet, ask them to join you for your first class to help calm your jitters. Keep in mind that many studios offer complimentary classes and mats for first-timers, so check online or call ahead to see what’s available. Showing up on the mat for your first class can be intimidating, and that’s okay. Try to channel your nerves into enthusiasm and remember to stay open-minded. Avoid having “built-up” expectations of either your body or the class, Pappas suggests. “The most important thing is [to] get in the room and . . . show up for the experience,” she adds. Everyone starts as a beginner, and although trying a new fitness regimen can be scary, it can also be rewarding. For your first visit, the studio will probably ask you to set up an account and fill out a waiver, so plan to arrive 15 minutes before class. Some classes won’t allow late attendees, so get there on time. If you want extra assistance or have a preexisting injury, let your instructor know ahead of class. Alternatively, if you would prefer to skip hands-on body adjustments, let your instructor know before class to avoid any discomfort, Jabali-Nash says. Sweat-absorbing microfiber, or yoga leggings or shorts with some elasticity to be supportive, is a good idea. Also, be sure to check and abide by the studio’s dress code. Be wary of see-through leggings and super-short or super-loose shorts. Try bending or, better yet, practice stretching in front of the mirror before class to avoid unwanted flashes of body parts. Jabali-Nash advises beginners to pack a mat (if one is not provided by the studio), a towel, deodorant, water and a change of clothes. Avoid lotion and makeup and try to stay hydrated before and after class to avoid achy muscles. Most of all, bring a positive attitude and an open mind. Although envy is very un-yogi-like, it happens, and it’s normal to feel that way during your first class. It’s daunting being in a room full of yoga practitioners of various skill levels. But Jabali-Nash encourages students to feel inspired, rather than intimidated, by their peers. There is a high likelihood that you will teeter and totter and possibly fall during your first class. That’s normal. “Like a baby bird coming out of its nest, you’re not going to fly your first time,” Jabali-Nash says. Take a deep breath, get back up, and, when you’re ready, follow the teacher’s lead and get back into position. Making these mistakes is part of the benefit of taking a class at a studio with a certified instructor. They can help you find the safest and easiest way to accomplish the desired poses without causing unnecessary stress or injury. “This is a safe space for you to be yourself and try out new things,” Jabali-Nash says. Attempting a new workout regimen can be confusing, challenging and downright frustrating. “It takes so much practice to be able to do these things,” Pappas says. Be at ease with yourself, don’t force things and remember to stay patient, he adds. Savasana, also known as the corpse pose, is a relaxing position usually saved until the end of class. 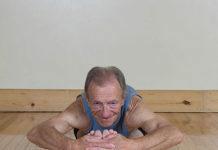 It is considered one of the most important and restorative postures in the practice. Although it’s tempting to get up and leave, use the pose as an opportunity to rest your body and chattering mind before returning to the outside world. Was the first class not your scene? Try a different style of yoga or studio before calling it quits. Jabali-Nash tried Bikram yoga for his first class but found a home with Rocket yoga two years later. Pappas agrees. “After my first class, I needed some time to process and get over that original shock of how difficult the class was,” she said. But she returned to the mat and began setting reasonable, short-term goals. For example, she gave herself three months of practice to complete a crow pose. After that pose, she moved on to the next. And the next. “You’re not going to see significant changes unless yoga becomes a consistent part of your life,” Pappas says.